I usually just release these out on the AP but sadly the last one died. Instead, I'll post it here for anyone who wants it! It's a 10th gen golden wyvern descendant of Shao Shi. Claim the shimmerkin! I was able to find a breeding pair for my most prized tinselkin and now I've got plans to make a line with all six tinsels and shimmers present, including artist alts! It looks incredible if I say so myself. If anyone's interested in any of the breeding pairs I have, feel free to throw me a message. 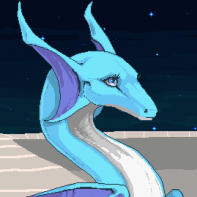 New Egg Form Dragon Breeder: helix9 (2) Team of Breeder: Flame Generation of Egg: 8th Lineage URL of Egg: http://dragcave.net/lineage/URUef Transferring or Keeping: Keeping! I think this means Flame can move on? Reporting as a new member of Team Flame! Transfer Form Sender: a_god_s (2) Team of Sender: Salmon Receiver: helix9 (2) Team of Receiver: Flame Generation of Egg: 7th Lineage URL of Egg: http://dragcave.net/lineage/3lpfE Transfer Form Sender: Tsukishine Team of Sender: Flame Receiver: helix9 (2) Team of Receiver: Flame Generation of Egg: 7th Lineage URL of Egg: http://dragcave.net/lineage/sDDfI Awesome! And I breed these two together, yes? Alright, so I've concocted a huge lineage that I've mostly come across by sheer luck (and awesome trades). Basically I've had this dragon for a while, but nothing to breed it with. So I just bred this egg to be it's partner, so fingers crossed! It gets better though, because I also have this guy waiting in the wings for when I breed the above two, which means I will have all of the colors of tinsels and shimmers in one lineage (including artist alts)! If anyone is interested in any or all of these pairings, feel free to ask. I love to show these guys off. I can take a second line. After some initial swaps, I've just been waiting for news for team Leaf anyways. I just got my second summon today, after I got my first one back in December! This time I was able to do it with my male CB Magma Quiaglith. I'm so happy to know that I can finally check this off my goals list! Just wanted to post and say I am very much here, but my forum activity would say otherwise. Good to see gen 7 trading! I went to name one of my frozen hatchlings after her parents, and apparently Nightmare in Hell hadn't yet been taken. Which is awesome for me of course. All I can say is that I'm going to be plenty busy the rest of summer with all of these guys. I wasn't even expecting alts but now it seems pretty obvious to do one. I love taking surveys. I also never realized how much I do and don't use on the forum until now. Just missed out on a CB gold in the jungle! I was looking for dinos and trying to clear out the cave blockers, when I saw a CB black and clicked that one open in a new tab, and then a split second later I saw that elusive description of a gold right next to it! And when I clicked, I got "you are already overburdened..." since I had grabbed too many cave blockers by then! (I did get the CB black though.) Ah well, another time perhaps. I didn't even notice the 49th one, because I only waited the regular amount of time between the last one I caught and this one. Good thing I checked to make sure! I am forever in love with the Guitar Hero egg. And I'm glad to see the Homestuck egg make a comeback as an april fool's joke (and rightly so, haha). Finally, I've got a pair of two sixth gens that will hopefully breed my third 7th gen! Now to start planning names for the fourth and final seventh gen branch of this crazy lineage of mine. Naming Form Dragon Owner: helix9 Team: Leaf Name of Dragon: EPIC Refreshing Wave Generation of Dragon: 8th Lineage URL of Dragon: http://dragcave.net/lineage/Xiljo I also have an additional misbred 7th gen (siblings to one of the above dragon's parents) named EPIC Unepic, in case that's important. So now I wait to get a traded 8th gens to breed with the one above? Beloved skywings Refused your lineage mate Wrath is swift after.